Back to land again, & that's all the first figure..
From my first figure, to my first building, & the original inspiration for Hawthorn Bay.. When the first Trunk/Ellwoods elephant family I purchased arrived (secondhand from eBay) I found that they were not in the best condition (rather worn & with damaged flocking on their feet) & so I bought a second elephant family in better condition. The second came with Madeline's Boutique & the Village Shoe Shop & I instantly loved the little cottage shop. My initial plan was to customise & possibly spray paint the (very) pink Madeline's Boutique & turn it into a clothing shop for the crocheted clothes I'd already begun to make for Sylvanians, but I realised it would be easier to buy one of the cottage shops in another colour & use that instead, & use the pink Madeline's Boutique for something else. So, in October I bought a Souvenir Shop (the same cottage shop style as Madeline's Boutique, but in white) to use for my crocheted dress shop & at some point I noticed that the cottage shops, with their boarded outsides, bay windows & fancy little porch/awnings, when stacked on top of each other, reminded me of the painted ladies of San Francisco - the beautiful painted & brightly coloured Victorian & Edwardian houses, such as the ones in Steiner Street that make up "Postcard Row". 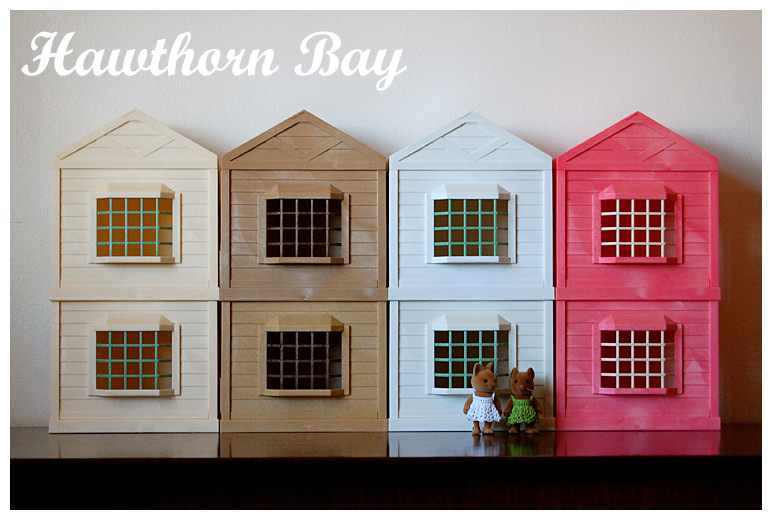 I decided that I wanted my own little row of cottage shops - a miniature Sylvanian take on the painted ladies of San Francisco & began to collect 2 of each colour of the cottage shops. Unlike the painted ladies of San Francisco, these will be a row of shops on a street I've nicknamed "Neopolitan Avenue" (because of their Neopolitan ice cream colours). I have lots of plans for Neopolitan Avenue, but will write more about that at a later date.. 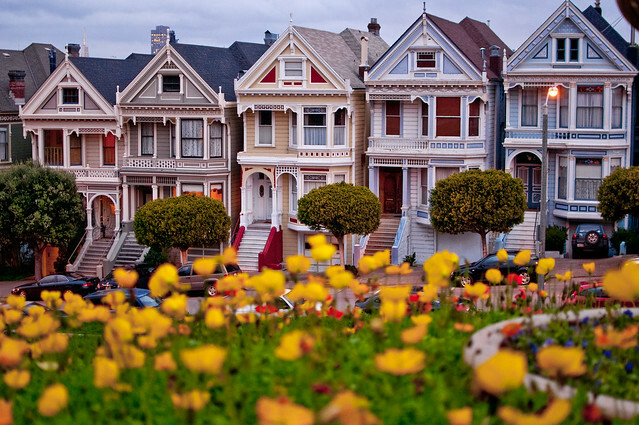 I love San Francisco, I've visited the Bay Area a number of times & also lived there for a short time. 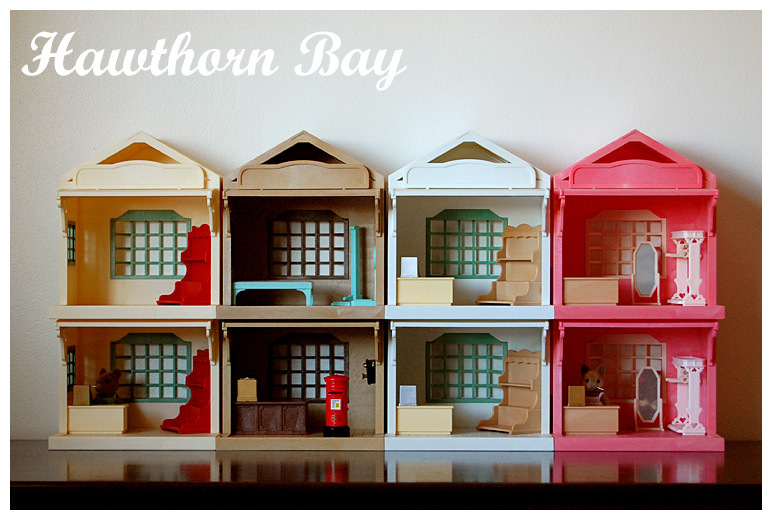 I've always loved the beautiful Victorian & Edwardian houses there & so Neopolitan Avenue, & Hawthorn Bay, forms for me a connection between my Sylvanians & a place that I love & miss. I might never be able to visit San Francisco or the Bay Area again, but I can create a small imaginary place inspired by it for my Sylvanians to inhabit. In my mind Hawthorn Bay combines many places in & around the Bay Area that I visited & loved - San Francisco, Santa Cruz, Point Lobos, Lake Tahoe, Bodega Bay, the beautiful redwood forests, coastline, mountains & lakes of that region, but rather than being placed in the contemporary world, it resides in an imagined time more informed by the earlier settlement of the Bay Area by Europeans in the 18th & 19th century (with just some elements of the contemporary world). It's a world that's still forming in my mind & I'm looking forward to imagining it more & writing about it here. 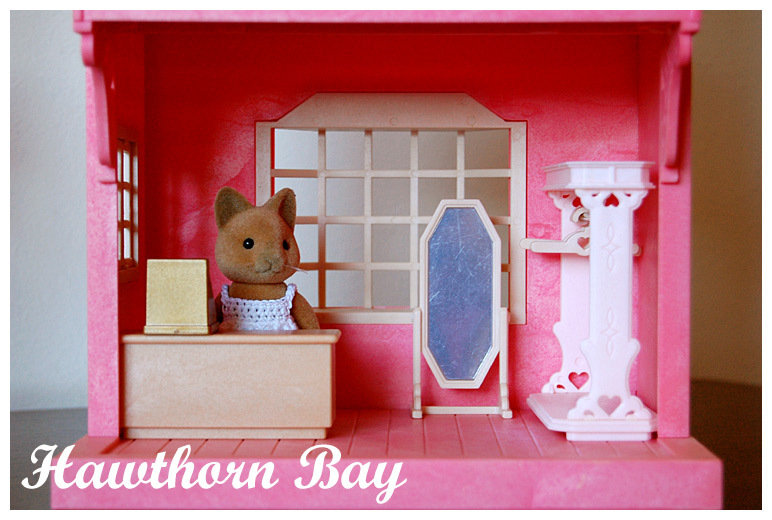 It seems fitting that for my first post I introduce the first Sylvanian to join my collection, Sophie Snow-Warren from the Sophie's Dolls House set. 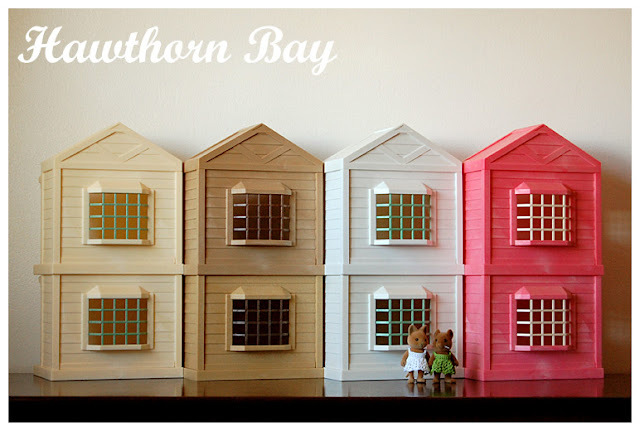 I bought the Sophie's Dolls House set back in 2007 because she came with 2 miniature doll houses (tiny versions of Bramble Cottage & Lakeside Lodge) + miniature furniture for the houses, which I wanted for my small ball-jointed doll. 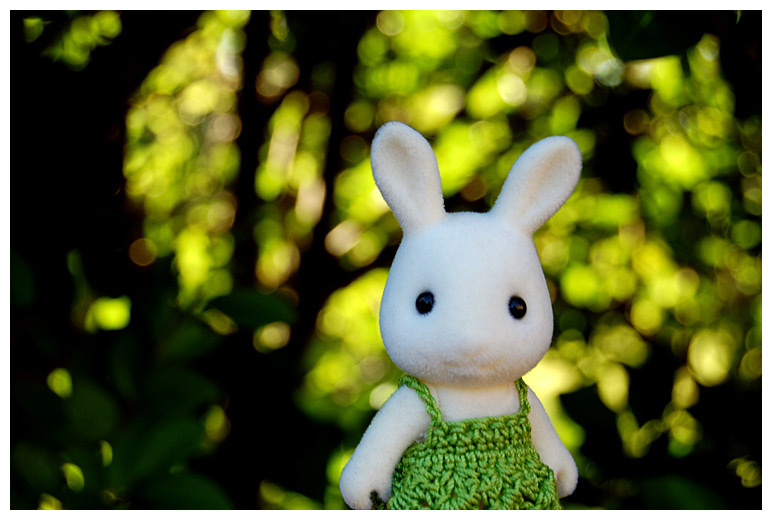 Sophie became a friend for her & until just over a year ago she remained my sole Sylvanian. 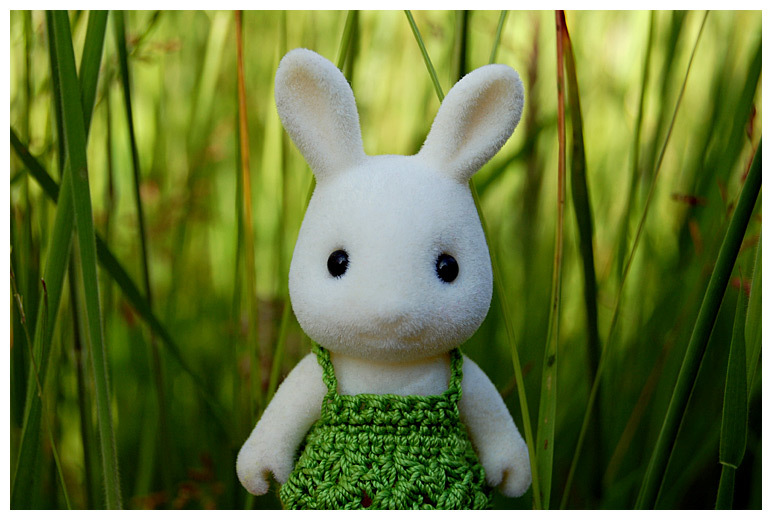 Sylvanian Families were a little past my time when they first came out in 1985. At the time I was 13 years old, & more interested in fashion design, art, & alternative rock & post-punk music. 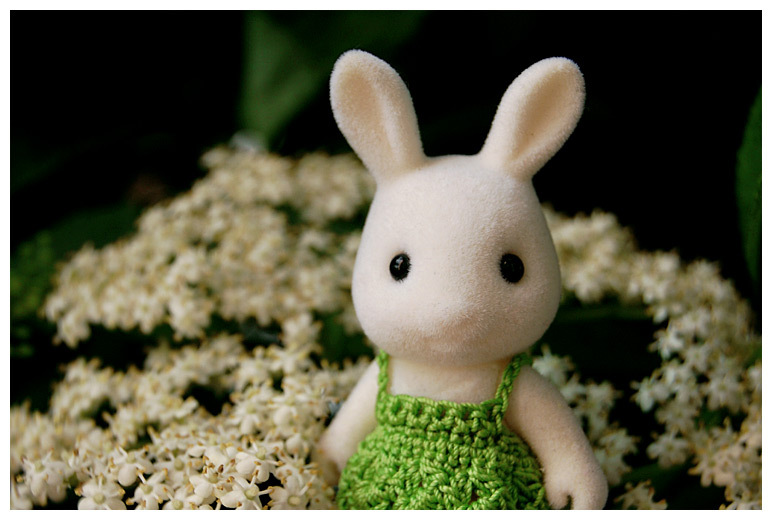 From the 1990's onwards I often looked at Sylvanian Families items in toy shops, appreciated their cuteness & considered buying some, but when I got more into dolls & toys as an adult, my interests for many years were larger 1/6 scale dolls. In more recent years my focus has shifted more & more to smaller dolls & dollhouses & miniatures & so I guess it was only a matter of time before the world of Sylvania beckoned. 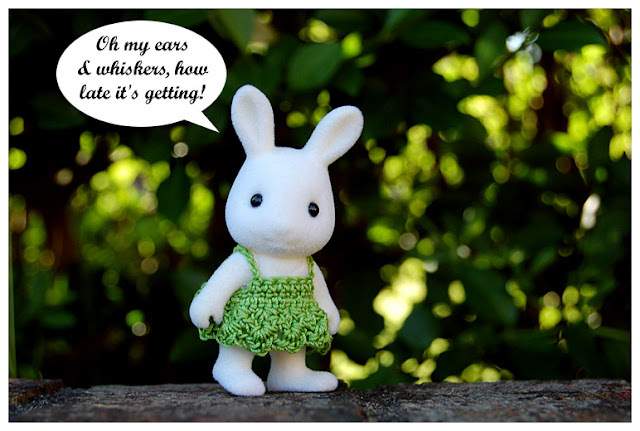 At first I was drawn solely to the rabbit families, & I thought they would be the only figures I'd collect, but in September of 2014 I added the Trunk elephant family to my tiny ragtag collection of rabbits & from that point I got sucked into the world of Sylvania more & more. 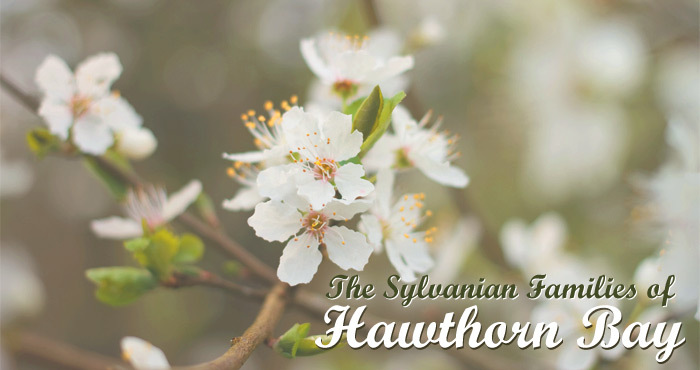 Hawthorn Bay is my imaginary little corner of Sylvania, but I'll write more about that another time.. 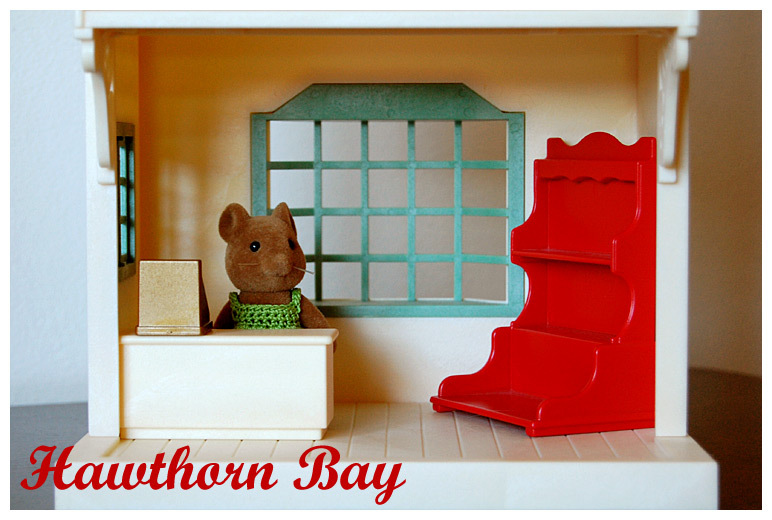 It's taken me a while to finally get going with this blog, but I hope you'll enjoy learning more about the Sylvanian Families of Hawthorn Bay, & my adventures down the rabbit-hole that is the world of Sylvania.